ENTRANCE HALLWAY	Cupboard housing hot water cylinder tank, wood laminate flooring. LIVING ROOM 14' X 11'4 Double glazed bay window, entyphone, tv point, wood laminate flooring, night storage heater. FITTED KITCHEN 7'8 X 6'8 Fitted with high and low level cupboards and drawers, working top surfaces inset single drainer stainless steel sink unit, double glazed window above, fitted electric cooker, washing machine and fridge/freezer, part tiled walls. BEDROOM 9' X 6'10 Built in double wardrobe, double glazed side aspect window. BATHROOM White suite comprising panel enclosed bath with mixer tap, shower attachment and screen, vanity wash hand basin, low level w.c. frosted double glazed window, part tiled walls. 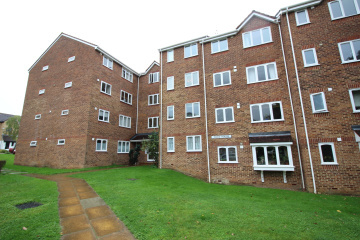 OUTSIDE	Situated in well maintained communal gardens.